Fort Gate Hotels and Resorts in Guruvayur Thrissur is a three star hotel is the latest avenue of style and grandeur, nestled amidst lush green coconut farms at Kottappady, a sleep village just 3 kms. away from the din and bustle of Guruvayoor, the temple town. Deluxe Rooms – well appointed deluxe non A/c double rooms with all modern amenities. Amenities and Facilities :- Writing Desk, Coffee tea making facilities, television with more than 70 channels, bathroom with shower with full amenities, hair dryer (on request), direct dialing facilities. Executive Rooms -The Executive Rooms are spacious, filled with light, elegantly arranged, extremely comfortable, the rooms are air-conditioned, offering working desk, hairdryer(on request) , telephone in the bathroom,working desk and coffee making facilities . The rooms have a direct dialing telephone connection. T V with more than 70 channels. 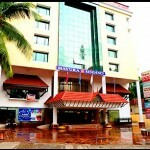 Facilities – Multi Cuisine Restaurant , Executive Lounge Bar , Banquet hall with 100 – 120 capacity , Travel Desk , Business Centre , Valet Parking , Laundry Service , Cellar Non A/C Restaurant & BAR, Ayur Treatment Assistance , Curio Shop , Doctor on call , Free pickup & drop from Guruvayoor Railway Station. Banquet Hall– Banquet halls perfect to organize parties and wedding ceremonies along with well equipped, beautifully designed and elegantly maintained conference and banquet hall. Banquet capacity is 100-120. Fort Mahal – The Bar – Walk in to Fort Mahal where you can encounter with a the choicest of beverages accompanied by great dishes. Bliss – The Coffee Shop – Get refreshed in style here with coffee, tea, snacks, softdrinks & ice creams etc. Fort Gate Hotel Tariff Rates generally starts from INR 1500 .